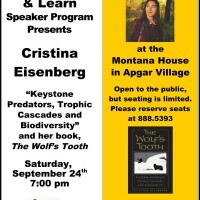 The Montana House and the Glacier National Park Fund are pleased to co-host a presentation by Cristina Eisenberg, Research Director and Conservation Biologist, and author of The Wolf’s Tooth. 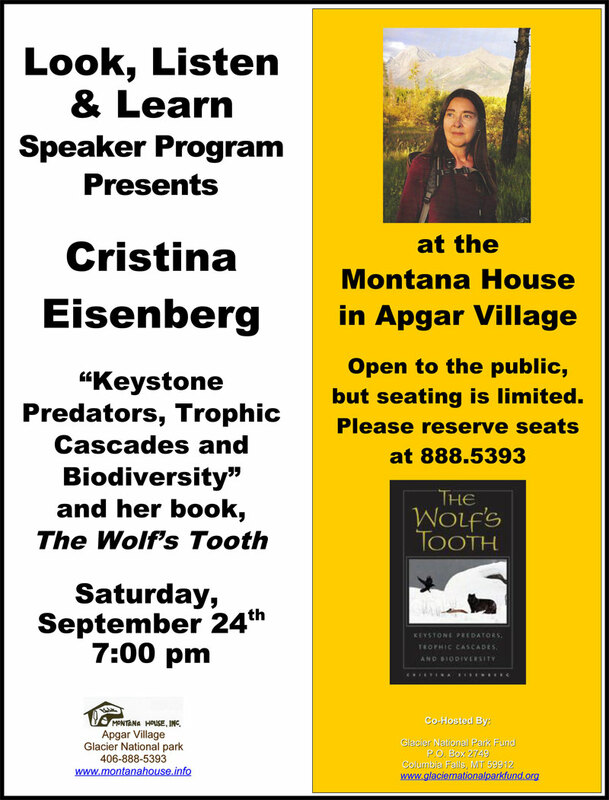 The event will be at 7 pm Saturday evening, September 24th at the Montana House in Apgar Village. In Glacier and Waterton Lakes Parks and in Colorado, Eisenberg has been studying the relationship of wolves, elk and aspen and how this relationship affects whole ecosystems. In The Wolf’s Tooth, she writes about how this relationship, termed tropic cascades, describes the relationship between predator, prey, and plants. Her book explores the reasons why big predators are needed. In the case of elk, when wolves are present, elk behavior changes from standing around complacently eating plants down to nothing, to being highly ware, to avoid being preyed on by wolves. Referred to as the ecology of fear, this dynamic causes the elk’s pattern of eating the aspen to change. This change increases the health of the aspen forests, with cascading effect on the songbirds, butterflies and insects, and the total biodiversity of the area, which contributes to better resiliency for withstanding climate change. In her book, Eisenberg gives the history of the study of tropic cascades, the role of top predators in regulating ecosystems worldwide, from oceans to prairies to tropical rainforests, and discusses her opportunities to revisit some of the key habitats where these relationships were first revealed and studied. The book serves as both a textbook and primer on the methods of scientific inquiry, and, as such has been used in college classrooms. Her work has been documented in Lords of Nature, in National Geographic, High Country News; in Glacier Park Magazine, on CBS; in the LA Times; and in The Denver Post. For her master’s degree in Environmental Studies at Prescott College, Eisenberg studied wolf ecology and management, with a focus on the work of Aldo Leopold. Currently she is completing her doctorate at the College of Forestry at Oregon State University, She is measuring the ecological effectiveness of wolves and the context dependence of trophic cascades effects. She is currently the Research Director on the High Lonesome Ranch in Colorado, which is being recolonized by wolves. She has also served Prescott College as a Master of Arts advisor since 2008. The presentation at the Montana House will be at 7 p.m. with time for questions and a reception to follow. The event is open to the public without charge, but seating is limited, so reservations are needed. Please call 406-888-5393 for additional information and to reserve your tickets. Hans and Toni Jungster established the Montana House Regional Craft Shop in 1960 in Apgar Village, just inside Glacier National Park. Their daughter, Monica and staff continue to carry on their mission: to celebrate and promote the creativity of Montana and Native American artists and craftsmen for our mutual benefit. The Montana House has been a long time avid supporter of Glacier Park and celebrated its own 50th anniversary on June 26, 2010. The Glacier National Park Fund is the non-profit partner for Glacier National Park, whose mission is to preserve and protect the beauty and heritage of the Park for the use and enjoyment of present and future generations. For further information, call 406-892-3250 or go to www.glaciernationalparkfund.org. Montana House has been supporting Montana artisans and enhancing the Glacier National Park experience for visitors for over 55 years in Apgar Village - the heart of Glacier.